Get the highest video recording performance with Class 10 rating for Full HD† video (1080p), plus more speed to catch the shot with your point and shoot camera. With SanDisk Ultra UHS-I cards you'll benefit from faster downloads, higher capacity, and better performance to capture and store more Full HD video. Take advantage of ultra-fast read speeds of up to 30 MB/s* to save time when moving images from the card to your computer. 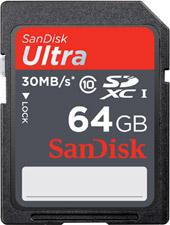 SanDisk Ultra UHS-I cards are water-proof, temperature proof, X-ray proof, shock proof‡, compatible with all SD/SDHC digital devices, and come with world-class customer support.